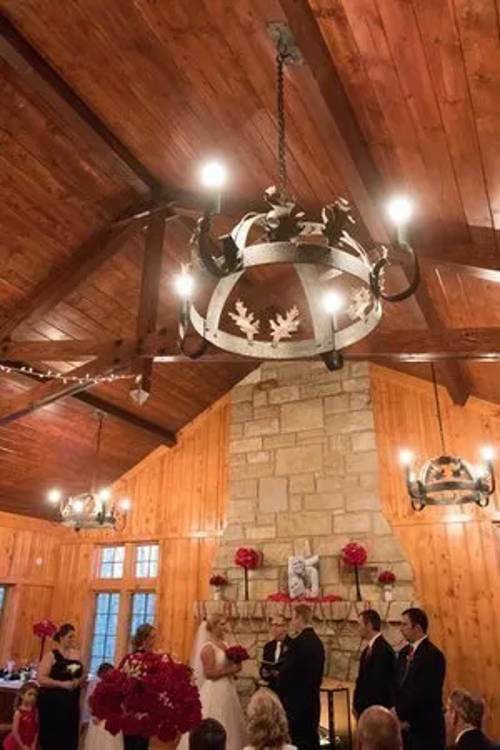 Pin Oak Lodge provides a beautiful rustic setting, whether you are looking for an outdoor wedding surrounded by nature or an elegant indoor wedding. Nearby guest cabins are available for rent with the lodge and provide a perfect opportunity for a weekend wedding getaway. The lodge features massive stone fireplaces, a rustic front porch, iron light fixtures with an oak leaf motif, pine floors, sturdy wooden benches and tables, and a full catering kitchen. Built in the 1930s, the cabins near the lodge have been updated to provide modern conveniences while retaining their rustic charm. The cabins include heating and air conditioning, restrooms with showers, microwaves, coffee pots, dorm-size refrigerators and linens.